For many years I lived on the north side of 43 degrees latitude, and you knew without a doubt that fall had arrived. The signs were crystalline, like scraping frost off the windshield in the morning, getting the boat put on its cradle and winterized, and seeing all of the plants up and die leaving a freezing bleak skeletal Cocytus like landscape that will soon be covered in frozen precipitation that lasts for months on end. That nostalgic postcard crap only lasts for about two weeks, then you have to get rid of all of the leaves, order firewood, hunker down, and watch your tan go away. I still have some shoes with salt line stains on them. Sunday, February 7th 2010 The "Longboat Key News"
Apparently nothing of magnitude was found during the raid, at least that was noteworthy in police reports, or the press. How much fun would that have been for a transient cruiser passing through to have assorted armed law enforcement agencies rooting through your vessel in the middle of the night. 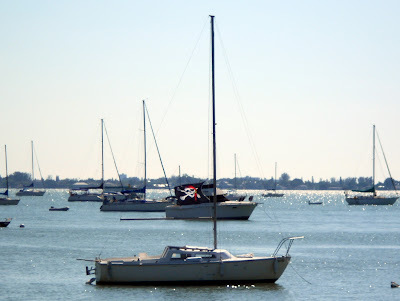 Certainly this should give all of us food for thought, and it begs the point that many Florida communities are not boat friendly at all, and NIMBY rules the waves. Wandering into the local West Marine store I noticed a beat up skiff loaded with barnacles parked near the front door, and a tall lanky Captain Nick Benge sporting a squid like looking machine that is effortlessly shearing barnacles off the boat, and it's motor's lower unit. I stop and gawk. I have fortunately had only the very occasional opportunity to scrape the extremely tenacious Mr. barnacle off hulls, and it was real work. 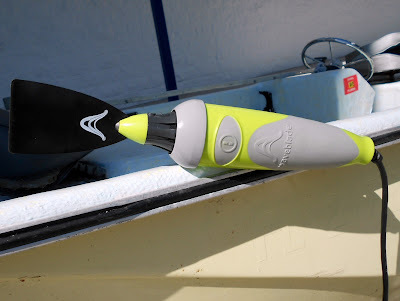 I am now watching Nick blow them off of the hull using one hand, and talking to me at the same time using the the new destroyer of barnacles, the Waveblade. 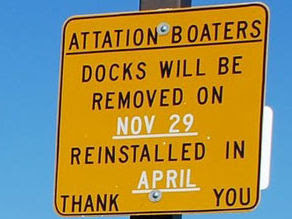 I have been in enough marinas to know the drill. The travel lift picks up the boat coming in for a bottom job, a pressure washer is used to clean the hull, and to remove most of the offending marine denizens, and then some poor guy has to scrape, blast, or sand the remaining barnacles, and their bases off. This is a hard, tedious, and mind numbing task. 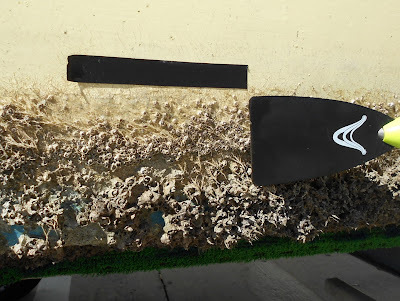 The scrapers often end up removing bottom paint, and scratching up the hull, and I have often seen barnacle bases buried under bottom paint. Watching someone do this with one hand, barely working, was an enlightening event. The blog has turned two, which in boat years is about 99. The year started out with a bang, and a lesson. The first story of the second year was 120 Seconds, and it got a lot of attention on the forums. The lesson learned is that attempting to defend yourself in the wild west of Internet forum land is often like pouring gasoline on a fire. I now rarely comment, and my skin is much thicker. You are traveling through another bad dimension, a dimension of not only frustration and ire, but of mind. A journey into a horrific land whose boundaries are that of poor workmanship. That's a signpost ahead, your next stop, the "No Wire Pull Zone". It's a hot day, and the air is as still as death. The wire fish slides effortlessly through the small hole and heads up the pipe, and then stops with a clink. The installer wipes the sweat from his brow, backs the fish off a bit, and tries again. Clink, and again clink. A flash of fear crosses the installers face as he nervously tries again and again to push the wire fish into the abyss. Clink, clink, clink, clink, clink. The installers sense of foreboding, builds to a peak and he screams in terror, for he now knows he has entered the "No Wire Pull Zone". This was the first time I had been to a NMEA conference, and I was there because I had been given the honor of being one of the three judges that would decide what new marine electronics product would be awarded the 2011 NMEA Industry Technology Award. 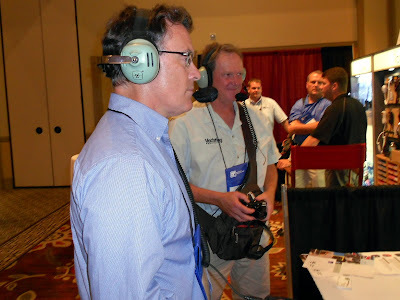 Below are fellow judges Tim Queeney, (front) editor of Ocean Navigator magazine, and Ben Ellison, (back) Bonnier's electronics editor most notably Yachting, and Cruising World magazines, and publisher of, Panbo, The Marine Electronics Weblog. This was most august company indeed for this humble installer to work with. Once upon a time a good local electronics repairman could fix your marine gear. Manuals had pages of circuit diagrams in the back of them. Of course then, TV's were black and white, and you could take the tubes out of them and test them. The trade off was the gear was very large, and was full of antique transistors, capacitors, crystals and the ilk. 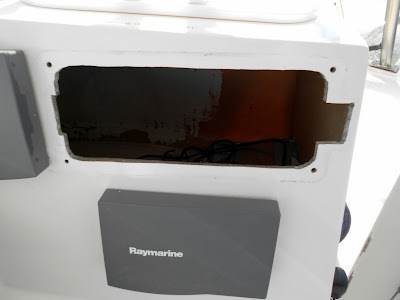 There are still a few of these specialized technicians around, but nowadays most marine electronics are repaired by replacing the bad board, or more often warranty repairs are done by replacing the entire unit, lock stock and barrel. The huge hole you see below had a VHF radio in it that has now joined those who are dearly departed. Language is a wonderful and changeable thing. 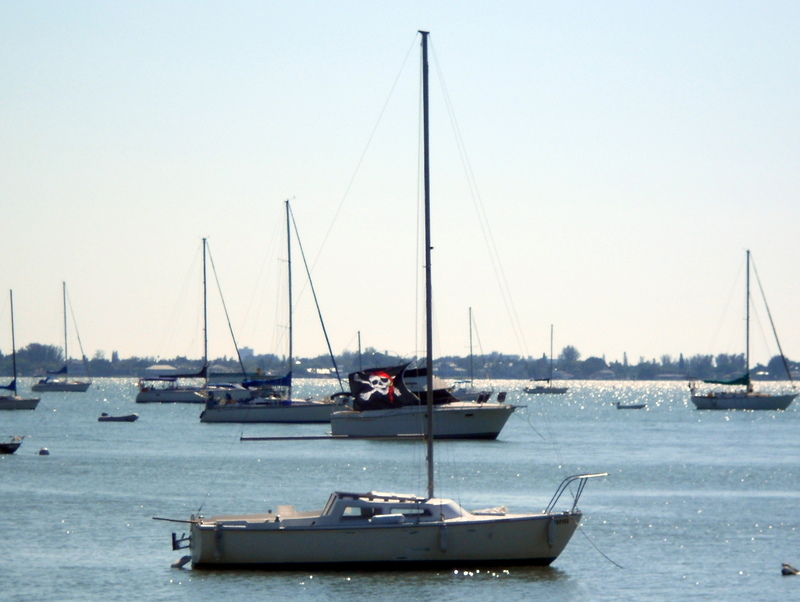 Acronyms, and our attempts to pronounce them can bring about decidedly weird effects, so today we are discussing the National Marine Electronics Association, or in its acronym form NMEA. 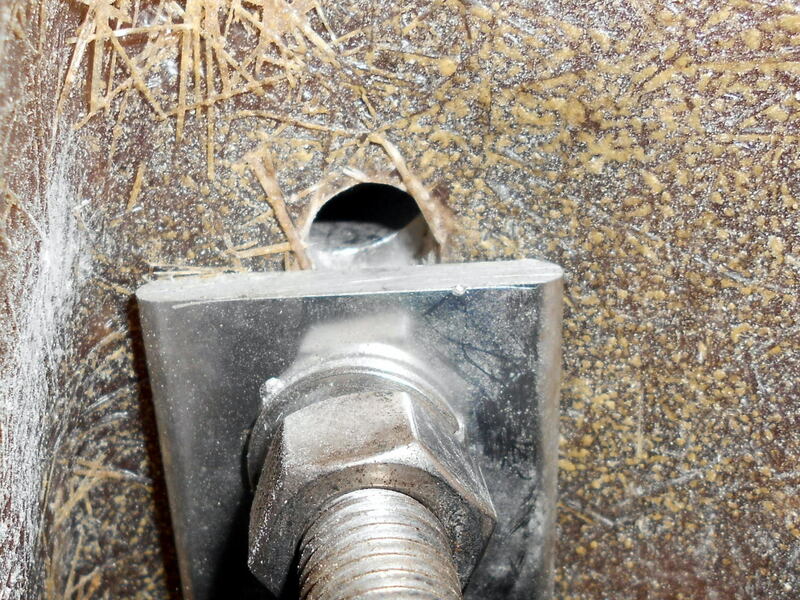 This is not to be confused with NEMA, the National Electrical Manufacturers Association, the National Emergency Management Association, or even the New England Multihull Association. Somehow over linguistic time, the acronym NMEA has ended up being universally pronounced, such as acronyms can ever be pronounced, as Nee ma. This verbal utterance has become so pervasive, that the marine populous, has actually changed the spelling of the acronym NMEA to NEMA to reflect how we actually say the acronym. 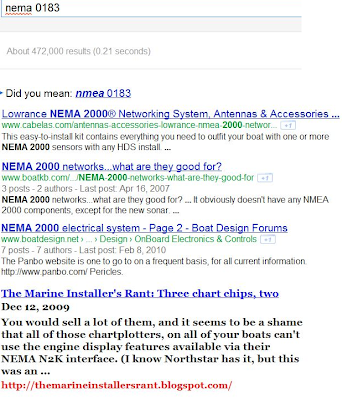 If you search "NEMA 0183" -NMEA, Google finds over 24,000 references. I did some snipping off the web of examples, and noted that even the Installer himself has screwed this up at times, and boy I'm not alone. I have purposely not changed it as a personal reminder to myself. The rate of change from NMEA, to NEMA has been increasing rapidly over time. There are a few references in the eighties, even more in the nineties, and in this decade using NEMA in place of NMEA is almost common place. So there are are three options available, do nothing, and continue to pronounce NMEA as Knee ma, change the name of the National Marine Electronics Association to the National Electronics Marine Association, or change the way we pronounce it to "NA Me Ah. My vote is to be diligent about spelling it correctly, and to continue to pronounce it Knee ma, or Knee maw if you live in the south. Tomato, tomahto, potato, potahto. 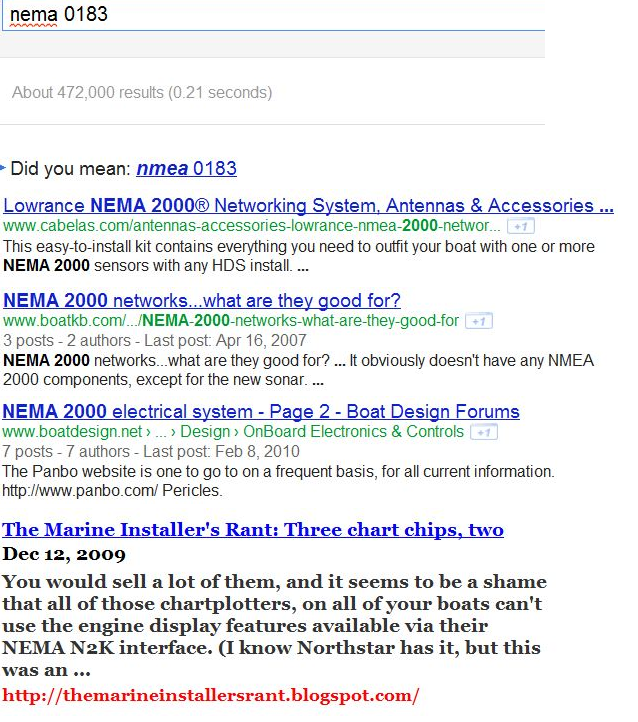 Nmea, (it is a word, sort of) that is a cool electronics network on your boat bro. By the way this was all triggered by attending the NMEA conference on Sanibel Island (almost). I am just about done with the piece. The photo above was taken by Canadian Phil Boisse.